think that SSQ is a brilliant tool to measure the satisfaction amongst guests and staff. and white, what we must improve to a guest that becomes more and more intolerant. Read the press release here (Swedish). See photos from the prize ceremony here. "We were not prepared for the enormous positive attention we received after winning the SSQ Award, both from the media and from existing and new customers. " "SSQ Award is really an important contributor in our work with improving quality. It gives so much back to participate so I recommend all hotels and restaurants to join the SSQ Award program"
"Achieving the SSQ Award again feels super, I am immensely proud of our organisation that takes part and eagerly works for the guests, the company and mankind (the environment). But – "no sun without a shadow" … The binder including the evident results is an invaluable help in our future work. (…) We discussed if we should let Arken join SSQ Award 2007, but decided that it could be a good INVESTMENT. Today I am happy to say that it is probably THE BEST INVESTMENT of the 30 millions we put down. A good hardware does not help if the organisation is not on the track – it is "A and O". We have got the basis to do a real makeover, we can focus on the right issues." "We chose to join SSQ Award as we recognized a tool for our on-going quality work. SSQ includes many important actions that you ought to carry out - presented in a package. After our first year with SSQ Award I estimate the binder with all reports as the greatest profit. It is an outstanding instrument for our future work. It clearly shows where to put our focus. We have utilized the result in different ways; a seminar for the whole staff when Janne Gunnarsson inspired us all by lecturing about hostmanship and issues that were obvious in the report, e.g. guest treatment and personal service were worked on in groups. The results from the guest and staff inquiries are of course focused in our business plan." "Yasuragi Hasseludden looks upon SSQ Award as a cost-efficient and a complete way to illustrate our strengths and weaknesses. The results from the surveys are consequently used to form the targets and to utilize our resources. Comparing with colleagues also gives us encouragement to perform." 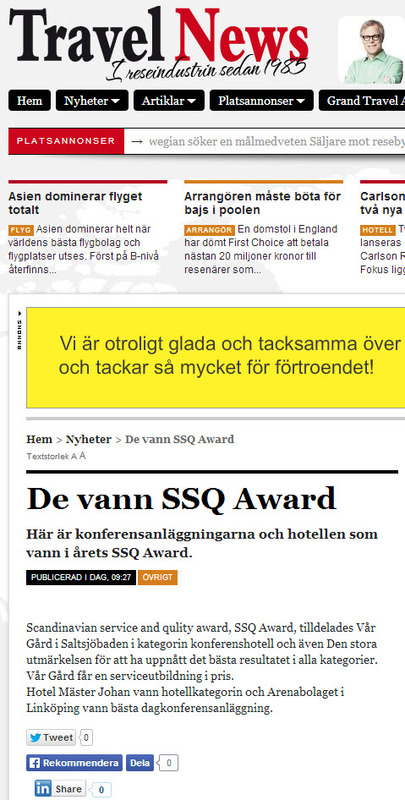 "Once again we have decided to participate in SSQ Award in order to further improve our quality. The mystery shopping illustrates how we treat our guests from the first reservation moment to the point where the group describes their experience of ambience, food and not least the treatment on the spot. The mystery shoppers and the questionnaires, answered by guests and staff, give us a good tool to continual refine and improve our service and in the end our contestability." "At first we did not realize what a spur we could get by using SSQ and the prize in our marketing. Now we know better! On all our covers, in all advertising and TV commercials etc, we make known that we have achieved Scandinavian Service and Quality Award. 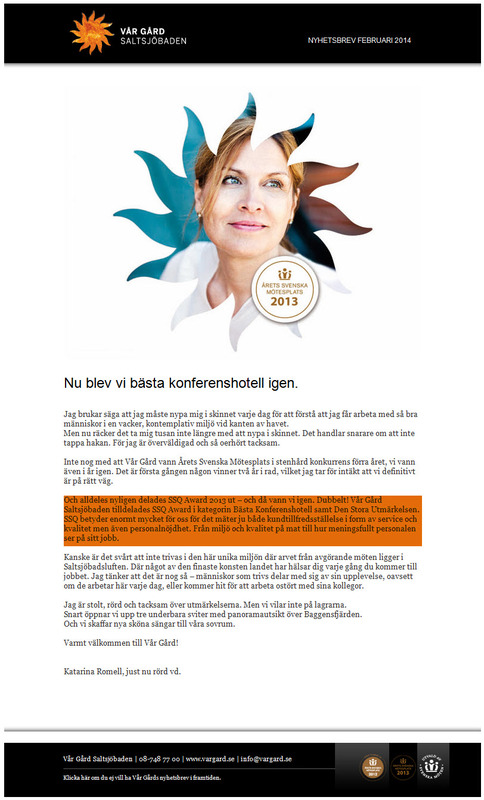 That has given us a strong image in the meeting industry all over Sweden. New guests feel confidence in Umeå Folkets Hus when it comes to our level of service, quality and environment." "SSQ Award gives me a well-defined tool that is easy to use for declaring to my staff what is measured, in spite of the problem to clearly explain "what good service is". It gives us all an extra kick to improve and to beat the client's expectations. It is an extra security that a neutral person regularly checks the issues that we ourselves are blind for. "The SSQ result is an important tool for management by objectives. Our strengths and weaknesses are exposed in black and white and help us to utilise our resources and to focus on the right actions. That is a great benefit. The element of competition is stimulating for the whole staff. It also makes us remember the importance of how we treat our guests in the daily meetings – from our answer in the phone to the personal encounter." "Hostmanship is not shown in printing. SSQ sets the hostmanship in focus"
"The hotel and restaurant industry contains mainly of small entrepreneurs. The daily work absorbs all time and the forward planning is not always prioritized. The companies doesn't have time to learn new methods for product calculation, pricing and table reservation. Much less develop and educate/train their employees. But despite this, an active quality management is probably one of the best ways to improve the profitability in long-term. The business concept of Restauratören is to be profitable for our readers. The magazine will generate ideas that vouch for better business. That's why the Restauratören stands behind the Scandinavian Service & Quality Award." "SSQ Award gives knowledge about strengths and weaknesses. That knowledge helps the company to go on with their improvement. We have chosen to work with SSQ Award to help the participating companies make sure that all their clients get the same quality in service and sales. Often it is a matter of attitudes and behaviour." "Why I think SSQ Award is important! Mainly because the award confirms to us and to our customers that our trade both CAN and WILL when it comes to settle service quality. Professionalism is a key word and the service process needs quality, support and constant improvement." "SSQ Award is a genuine program for improvement. It is a fabulous opportunity for a company to start a progress that serves business, customers and employees." "From my own experience in the hotel and restaurant trade and as a frequent guest at conference venues I often recognize how much more welcomed I should feel if the staff could devote time to take care of the guests, instead of putting energy into problems that could be avoided by training. The difficulties to understand how groups act. And why. The difficulties in managing without specific knowledge about management. All disagreements that occurred while I was sitting there and wondered why. What mistakes did I do as a leader? And all my questions about what I should have done instead. Today I have the answers to all questions. By changing my profession I now have the opportunity to help others that have the same thoughts I had, 14 years ago. It is immensely fun and we became very happy when we were asked to be a partner in SSQ Award."